Thanks for posting this...I love collecting stones. The moonstone is one of my favorites and I do have quartz, rose quartz, tiger's eye and hematite. As well as many others. Ironically a piece of lava rock my one grandmother gave me from Hawaii seems to resonate highly with me. I just love the colors and uses of the stones. I need to use them more but I mention on my blog how I used them to aid me during a phone interview I did. And they did help! I'm glad you found the post useful! Stones we find or have been given hold much more power than those we buy in the store. I'm not surprised the lava rock resonates with you the most. I'm going to be carrying some of mine with me when I begin interviewing for a teaching position next month. I hope they do the trick! where do yall get theses stones from I'm a starter on witchcraft and I also want to choose what type of witch I want to be but I don't the types of witches they have can you please help me with choosing I'm 15 by the way. Of course! Your local metaphysical store will have these crystals. They are all very common. A simple google search will allow you to find your closest store. If you happen to not have one in your area, there are many online metaphysical stores that carry these crystals as well. Its best to buy them in person though, that way you can pick crystals that speak to you. I am not sure I understand the rest of your question. Are you asking about picking what type of witch you wish to be? There are sooooo many to pick from and it is determined by your personality and the witchcraft you want to practice. If you wish to practice a bit of everything, eclectic witchcraft would be best. Feel free to email me at flyingthehedge@outlook.com and we can talk further. Awesome, I actually have all of these. Where is the most affordable and best quality to purchase these? Do you have a website that sells these that you now about? Or do you just search EBay, or Amazon? I go to my local metaphysical store. When it comes to crystals I have to touch them. You should only pick crystals that speak/resonate with you. Ordering them offline takes away your ability to only pick stones that will work well with you. Furthermore, there are a lot of scammers out there on Ebay and Amazon when it comes to crystals. Individuals are making fake crystals all the time, especially turquoise and citrine. Buying a fake will not work in your spells. Your local metaphysical store knows the difference and will be able to ensure you are getting on the best quality crystals. If you don't have a metaphysical store near you I suggest finding an online pagan store with good reviews. themagickalcat.com is a good one to shop from if you must buy online. Hey, I loved your post! I'm new to the art and am working on researching crystals, herbs, etc...I am wondering, have you done a post about where to research these? I have no idea where to start finding information on crystals, herbs, and the like. Thanks! I haven't made a post exclusively on researching crystal and herb uses. I do, however, write herbarium posts often about the magical and medicinal uses of herbs. You can find what I've covered under the Herbarium tab. Other sources I suggest are Scott Cunningham's books on crystals and his book on herbs. They are offer a brief overview of magical uses and are a great introduction. The Crystal Bible is talked about often, but I haven't personally read all of it, just browsed through the pictures. Google is your friend. There are several sites dedicated to crystal uses and herb uses. Of course, read critically and cross reference information for accuracy. I'll add a research post to my list of post ideas. That would be a good one to put together. Thanks for reading and good luck on your journey. Hi. Someone I know is using crystals to do witchcraft against me, trying to break up my marriage. How can I protect us from this? I would suggest cleansing your home, putting up some protection spells, and maybe both of you wear or carry quartz or black tourmaline. Excellent protection and grounding stones. Rose quartz in the bedroom can enhance love between the two of you as well. However, if your marriage is having troubles, there are likely non-magical issues to blame. Sometimes, try as we might, there isn't anything magical or spiritual to blame. I also strongly encourage marriage counseling or at least some thoughtful communication between you are your significant other. The first line of defense is a good offense. If you guys have a healthy, happy marriage, no amount of spell casting is going to destroy that. Hi, I was in a local store to pick out a certain clear quartz. I walked in with some friends and they had a little talk with the owner while I was looking for my stone. Then I wanted to purchase it but instead the owner gave it to me :) It feels very special to me. How can I use the power of this quartz to the fullest? Thank you! That's awesome! Quartz is one of those crystals that can be used for just about everything. It not only protects, but amplifies other crystals and magic in general. I'd just it for everything! Good luck and thank you for reading! 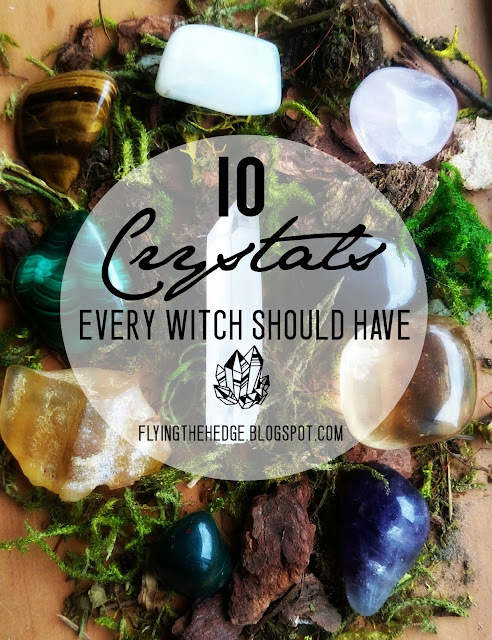 I am too a hedge witch but as for this list I cannot touch Moonstone, as make me feel sick...and it feels so wrong to just touch one. I was offered one once and asked to pick one and promptly had to leave the room and visit the bathroom !! Lupis for me is the missing one on this list. Interesting. My SO has a crystal he purchased a couple months ago that shocks me every time I touch it. I can't remember what it is, but it clearly doesn't like me around it, so I leave it be. I won't even pick it up off the floor if my cats knock it off the night stand. I'm sorry moonstone has such an affect on you. It is one of my favorite crystals. In fact, I wear a moonstone ring EVERY day. My mom really like lapis lazuli too, but it can be expensive to acquire. I tried to make the list cheap and full of crystal you can find easily at a nonmagical shop, but I did indicate that lapis lazuli can be used alternatively for amethyst. Thank you for your input and thank you for reading! Hi, I was wondering if you could help me find were to start my journey?